The Libertarian Perspective: Is The Government Really Protecting Us? I find looking at this information very interesting. There are many topics that one could discuss based on these facts alone, but I would like to focus on one in particular: something I shall call the "Death Trade Deficit." 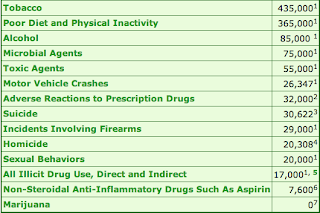 "In 2006, a total of 38,396 persons died of drug-induced causes in the United States (Tables 21 and 22). This category includes not only deaths from dependent and nondependent use of legal or illegal drugs, but also poisoning from medically prescribed and other drugs. It excludes unintentional injuries, homicides, and other causes indirectlyrelated to drug use, as well as newborn deaths due to the mother’s drug use." So, even this number is a drastic over-representation of the dangers of illegal drugs such as cocaine and heroin. I would also like to point out that tobacco and alcohol are the number 1 and 3 killers respectively, yet they are not only legal, but celebrated by those who seek to keep other drugs illegal. The most intriguing thing about the United States Drug Policy is its willingness to look the other way when legal American products are causing so much more death and pain. This leads me to my next point and the Death Trade Deficit between Columbia and the United States. Columbia is known for its production and distribution of cocaine or "Columbian bam-bam." This drug is demonized and the Columbian drug lords are seen as America Killers. Of course cocaine is not a good thing to put in your body, but neither is fast food, tobacco, alcohol, and others (and they are the top 3 killers mind you). However Cocaine is nowhere near as deadly as those things that we as Americans embrace. In fact, more people die in Columbia from our drug lords (RJ Renyolds and the like) than Americans from the Pablo's of the world. "At 46 million people, Colombia is one of the largest countries in Latin America to enact a comprehensive tobacco control law. About 25,000 people in Colombia die each year due to tobacco-related illness." Source. Compare the numbers and you will see that even the inflated number of 17,000 who die each year in the United States from all illict drugs (that means not just the cocaine that is imported to the states) is still 8,000 less than the 25,000 people who die every year in Columbia from our largest drug export: Tobacco. This means that the Columbians really have more reason to be mad at us then we have to be angry at them. They are running a trade deficit when it comes to death. We export at least 25,000 deaths to Columbia (this of course assumes that they are only using American made tobacco products, but I am also assuming that we are only using Columbian cocaine) so that means that the Columbians are importing more death then they are exporting. This is just one more point that makes the War on Drugs look even more ridiculous. Not to mention how many more deaths the War on Drugs causes because of the nature of an illegal or black market. American officials use violent force, coercion, and untold amounts of money to get rid of this "scourge." Yet, drugs are the least of our worries statistically, and thousands die every year because of the ramifications of our policies both in increased crime due to the black market and in direct confrontation with police and DEA forces. As a side note, I would like to also point out the last item on the list above. In its thousands of years in existence and use, there has never been a documented case of death caused by Marijuana alone. Sadly, the same cannot be said of Tobacco, Alcohol or even Aspirin. These are all points that should be at the forefront of the debate. Is America really doing its citizens and the world a service by punishing people for using a substance that causes no documented physical harm (other than those attributed to the act of smoking in general). It is a great injustice that adults are not treated as such. In a free society, people should be able to choose for themselves what they want to put inside their bodies. This also means they can choose what not to put in their bodies. Most people don't use illicit drugs and if they were legalized that would not change much because people have already made the decision. Ask yourself this question: If heroin or cocaine were legalized tomorrow, would you use them? For probably about 99% of those responding to this question, the answer would be no (only 1.5% of Americans have ever used heroin (2005)). Why? because legality is a small part of the equation. Everyone does illegal things whether it's speeding or not reporting that 20 dollars you made in the (illegal) office fantasy football bet. Yet, most of these law breakers have decided to not use illegal drugs, not because they are illegal, but because they don't desire them.